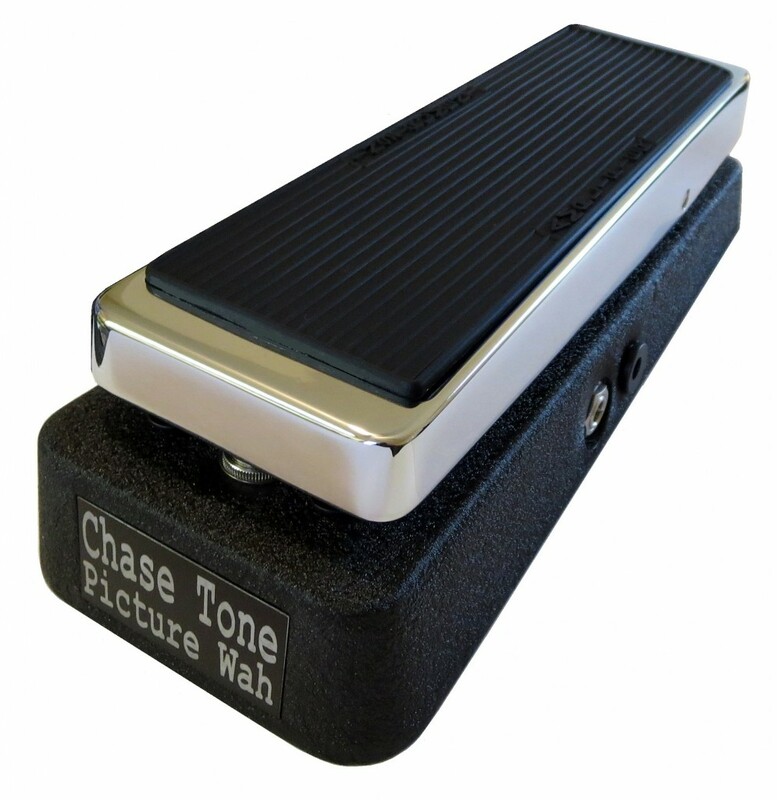 The CHASE TONE™ 1967 Picture Wah™ has a pronounced, thick vocal ‘WAH’ voice with a longer, smoother bass-midrange-treble sweep; extremely vocal both clean and distorted. The detailed and toneful mid and high frequencies cut through the mix with ease, but are fine-tuned for a smoother flavor top end compared to vintage originals, so there’s no ear fatigue. Please check out the sound sample below! Chase Tone has replicated the vintage black texture of the 1960s! The finish is a powder coat offering superior durability and zero ozone emissions! The chrome is a hexavalent chrome – the same chrome used on 1950s & 1960s hot rods! * Military Grade Fiber Glass Circuit Board with Plated-Thru-Holes for a superior connection able to withstand years of world tours. * New Production (1968-1969 material & cosmetic spec) Carbon Film Resistors. * Custom made low gain silicon transistors to exacting specs of the best NOS European transistors found in the original Italian Vox wahs. * Real vintage 1960s Mullard Tropical Fish polyester capacitors. 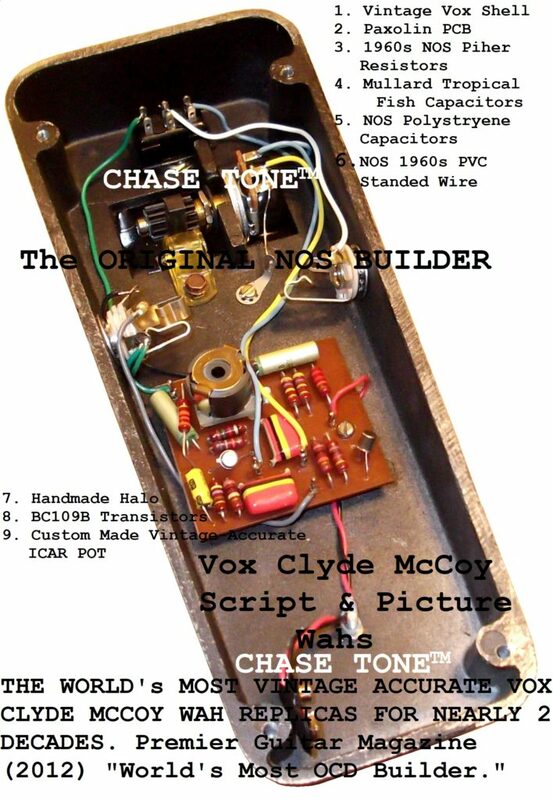 Same used in original 1960s Vox Clyde McCoy Wah Wahs. * Rare, high quality NOS Polystyrene capacitors as used in the original Clyde McCoy & Italian V846 Wahs. Prized by audiophiles for the ultimate silky-smooth, clear tone. * Bipolar electrolytic capacitor as found in original Italian Vox V846 wahs. * PVC stranded copper wire. * True-Bypass Ribbed front bumper to prevent accidentally turning off switch but still allow easy turn ON ability. (Custom Option: Vintage-Bypass: This lessens high end offering a smoother warmer response from some vintage tube amplifiers. Vintage-Bypass is part of the sound heard on those famous recordings and changes the wah tone in the ON position slightly, so it can be built this way to replicate this.) Customers normally prefer True-Bypass unless using only a few pedals and loud tube amplifiers. * High quality Switchcraft open jacks. * Adapter jack on output jack side of chassis for negative (standard) ground adapters. Polarity protection and noise filtering circuitry installed. * Black bottom plate (with large vintage replica rubber feet) same as transitional wahs in the Clyde McCoy to V846 era. * Improved pivot mechanism offering a smoother performance. It will not flop forward when leaving it in one position for that vowel-y frequency mid or treble boost. * Ultra Lightweight Aluminum weighs a fraction of the traditional zinc wah enclosures! 30 Day Return Policy for USA buyers. 1957 Fender Tweed Champ Replica w/ Deluxe size speaker cabinet & 12″ Weber Alnico speaker.